President Calvin Coolidge donned cowboy regalia while at a July 4 celebration in Rapid City, S.D., in 1927. Vermonters may be fairly familiar with the Coolidge Homestead in Plymouth Notch, but there are few reminders of Calvin Coolidge's presidency beyond his native state. However, a visit Coolidge paid to South Dakota 90 years ago is credited with helping create an iconic national memorial and shaping the economy of the Black Hills. Audio from this story will be posted. At the South Dakota Festival of Books in Deadwood in September, authors gave talks on a wide range of topics. Many were focused on the history of the region — and one had a Vermont connection. In the summer of 1927, President Calvin Coolidge and First Lady Grace spent three months in western South Dakota. Rapid City journalist Seth Tupper has written about the visit in the book Calvin Coolidge in the Black Hills. “What made Coolidge’s choice to go to South Dakota unique was no president had ever established a summer White House that far away from Washington or for that long,” Tupper told a roomful of festival-goers. Tupper explained that Coolidge chose South Dakota for both political and personal reasons. Coolidge wanted to summer in a cool, dry location. It was also suggested he could mend fences with farmers over his veto of the McNary–Haugen Farm Relief Bill, which was intended to increase prices paid to farmers by having the government purchase surplus commodities. Transcontinental air mail service was expanding at that time, making communications from a then-remote and sparsely populated area much easier. “Out here, in 1927, to have a sitting president anywhere in South Dakota was amazing. I think they were just so thrilled by that,” says Tupper. Coolidge’s summer in the Black Hills also got the attention of the rest of the country. A contingent of local and national reporters covered the president, who stayed at the Game Lodge in Custer State Park and commuted to an office in a converted classroom at the Rapid City High School, which was later named after Coolidge. Tupper says stories about Coolidge's visit appeared throughout the summer in papers across the nation, drawing attention to the Black Hills just as the era of automobile tourism was beginning. Roads were improved in the flurry of preparations that preceded Coolidge's visit, making the area more accessible by car. 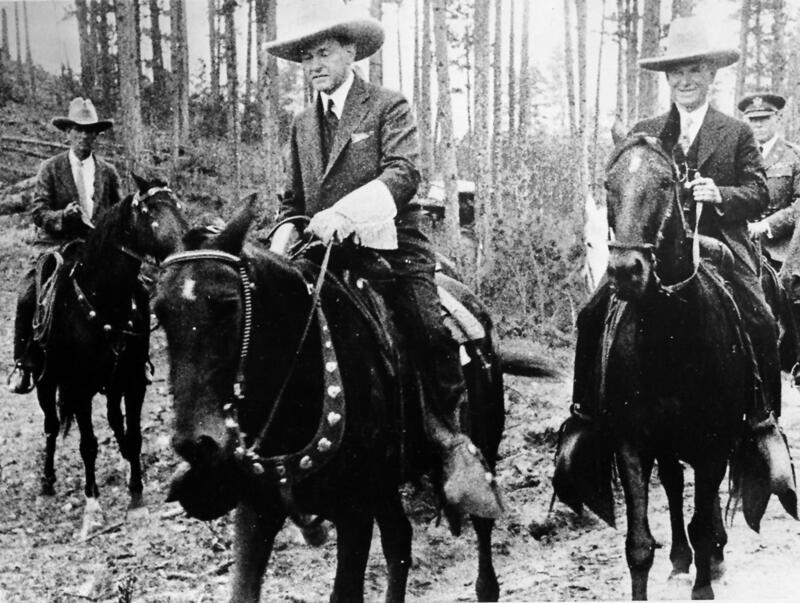 Coolidge makes his way on horseback to the dedication of Mount Rushmore Memorial in August 1927. At that time Mount Rushmore was only an idea and its supporters were having difficulty raising the funds necessary to make it a reality. But during his stay, Coolidge visited the site and — uncharacteristically for a president known for cutting government spending — pledged $250,000 in federal money to help the project. Today, Mount Rushmore is the foundation of the area’s tourist economy. The Coolidges attended Sunday services at a church in Hermosa, S.D. To most people living here, the Coolidge visit is an obscure footnote to local history — unless they have a personal connection to Silent Cal. A woman named Beverley Coolidge Shaw was among those who stopped to talk to Tupper at the festival’s book signing session. “There were four Coolidge brothers. And President Coolidge was the son of one of them and my father was the grandson of one of them," Shaw explained. "So, it’s kind of a distant, like second uncle. Something like that." She says the story of her presidential relative’s visit has long been part of family lore. It was memorialized at the Black Hills cabin built in 1938 that is still in her family. “My dad painted the outhouse white and put a sign up that said, 'Coolidge’s Summer White House,'" Shaw told Tupper. On Aug. 2, 1927, at his office in Rapid City, Coolidge passed folded slips of paper to reporters. On each was written the words, “I do not choose to run for President in 1928.” Coolidge offered no further comment on his momentous decision and no one knows exactly when he made it. Tupper believes it’s possible Coolidge had made up his mind before he came, or early in his visit, because the president seemed somehow different and more relaxed in the Black Hills. “There was a love affair between South Dakotans and him because I think they saw that he was really enjoying it out here. The fact that he would wear a 10-gallon hat and do all this stuff really endeared him to the people out here,” Tupper says. In photos from the era, Coolidge is often as unsmiling as ever — he even goes fishing in a business suit — but there is evidence of a more lighthearted man. There he is panning for gold or showing Grace a fish he caught in a stream specially stocked for the "angler-in-chief." Other photos show him decked out in cowboy regalia or wearing a headdress presented to him by Sioux Nation leaders who pressed their claim to the Black Hills. This picture was taken at an anniversary celebration of the Deadwood settlement. 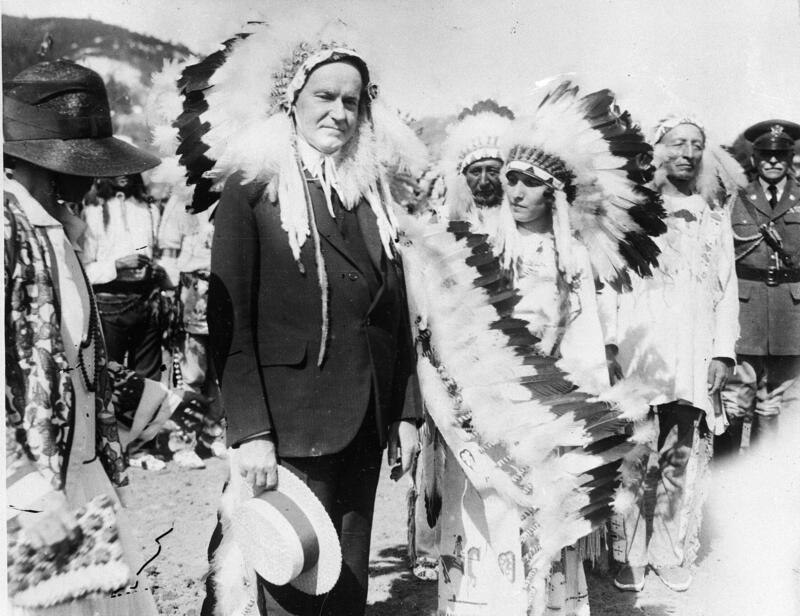 Coolidge's ceremonial adoption by the Sioux Nation was an opportunity to press tribal claims to the Black Hills. What’s remarkable in many of the photos is the size of the crowds that gathered wherever Coolidge appeared. “They kind of followed him around,” says history buff Pat Roseland. He’s collected hundreds of photos and articles about Coolidge’s visit. “I just found out at one point that he was here, which I did not know. That was quite a few years ago, and everything I found on Coolidge, I collected,” says Roseland. All around the dining room of Roseland’s Rapid City home, Calvin Coolidge stares back from panoramic yard-longs, old postcards, professional photos and family snapshots. Roseland has purchased many of them on eBay, but others have come from local families that have passed them down over the years. Roseland imagines some locals might stumble across a picture of Coolidge in their attic and wonder, "Who is that guy?" 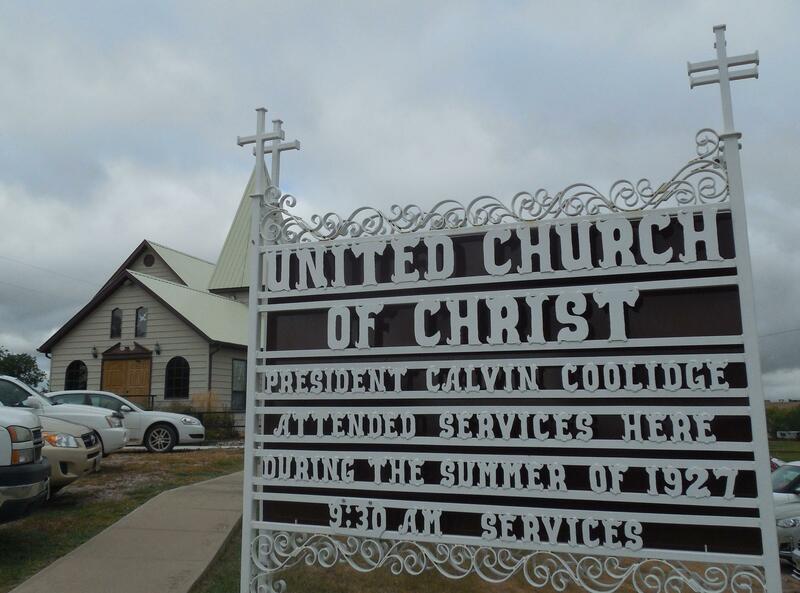 “Most people don’t even know about him anymore around here,” he says of Coolidge’s visit. Roseland says that’s too bad, because the Vermonter who vacationed here in South Dakota 90 years ago had a role in shaping what the area has become today. “He was a big part of Rapid City history in the '20s. Basically with his visit, that was basically the beginning of the tourists. After his visit, that put Black Hills on the map,” he says. There are still reminders of Coolidge’s visit to the Black Hills. A campground and creek in Custer State Park are named after Grace Coolidge. And, of course, there’s Mount Coolidge. Here and there, a few signs still recall the presidential stay of decades ago. A Vermont historic site will celebrate the birth of the country and the 30th president on the Fourth of July. A delegation of the Vermont National Guard will lead a march to the Plymouth Notch Cemetery on Thursday to place a wreath from the White House on Calvin Coolidge's grave site. Members of the Coolidge family plan to attend. Friday is of course Independence Day, but it’s also the birthday of President Calvin Coolidge, one of only two U.S. presidents born in Vermont. For years the Calvin Coolidge Presidential Foundation has held an event to honor the only president born on Independence Day. Matt Denhart is the new executive director of the foundation, and it will be his first time at the celebration. AP Photo / Thirtieth U.S. President Calvin Coolidge. President Calvin Coolidge is remembered almost in caricature today as a lsquo;true Yankee': taciturn, frugal, practical and possessing deep roots in a Vermont hill farm. Coolidge never struck his peers as lsquo;mostly likely to succeed' but he eventually served six years as a largely popular president during a time of massive social, economic and technological change. There are few more impressive combined engineering and artistic marvels in this country than Mount Rushmore in South Dakota. One of the individuals who had an integral role in its creation was its chief carver, Luigi Del Bianco, an Italian immigrant who spent some time as a stonemason in Barre.